The species that most commonly affect horses are large and small Strongyles, Oxyuris Equi (pinworms), Strongyloides Westerii (threadworms), Dictyocaulus Arnfieldi (lungworm), tapeworms and bots (fly larvae). Exposure to worms is a necessary part of acquiring immunity against internal parasites and therefore it is undesirable that an anthelmintic (anti-worming) program is too rigorous. Some horses despite being maintained in the same environment as herd mates, sustain less of a worm burden than others. It’s been determined that a genetic factor provides these horses with greater immunity against worms than their companions. Foals and youngsters are more at risk than older or adult horses. Old and debilitated or sick horses are also at risk of sustaining higher worm burdens because their immune systems are compromised or failing. Mares provide the prenatal environment for their foals. A healthy mare that has benefited from good management is more likely to produce a healthy foal, which in the longer term will be less susceptible to worms. Large numbers of horses with limited grazing, as is often the case at riding and livery establishments will increase the probability of parasitism by worms. Stabled horses who may spend long hours in their boxes will usually \'clean up\' hay from the floor. The floor and walls may be contaminated by faecal matter thereby re-introducing worm larvae to the horse. Worms favour an environment that is rich in carbohydrates. Horses fed high concentrate feeds often have a higher worm burden than forage fed horses. Spring grass has a laxative effect and this helps to eliminate adult worms. Regular maintenance of pasture helps the worm burden on fields. Methods include mixed species grazing i.e. cows, sheep, even a few chickens or ducks, rotation of fields on a seasonal basis and either resting the field entirely or growing a hay or other crop. Regular chain harrowing (or raking) breaking up and spreading the manure exposes it to the desiccating effect of sun/frost/ birds. Removal of manure from fields or paddocks on a regular basis: Preferably daily, but otherwise weekly. In past years it was deemed necessary to treat horse for worms and internal parasites regularly with chemical wormers. This has lead to resistance to specific chemicals and the search for increasingly powerful cocktails. While heavy levels of parasitism can cause devastating damage to horses resulting in poor condition with unthrifty appearance, weight loss, distended abdomen, oedema of legs and sheath, colic, cough, diarrhoea, liver damage and even death; the need to treat horses against worms is dependent upon a number of factors. These include the environment, age of the horse and genetic factors. While a natural worming system may not always entirely replace chemical wormers, a natural worming system together with careful management of the environment, can reduce reliance on chemicals. 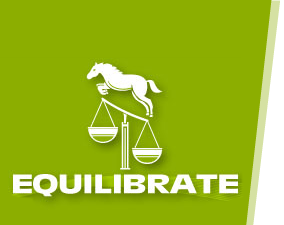 Equilibrate-Nutrition for the Balanced Horse; Specifically Formulated natural worming supplements can include a variety of herbs that are considered to be effective in reducing the level of worms by making the gut environment unattractive to parasites. These include thyme, parsley, garlic and wormwoodtogether withdiatomaceous earth. Its effect is abrasive, causing death of adult worms. Regular faecal egg counts are an essential part of a natural worming system. 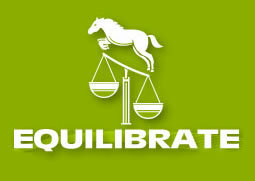 Equilibrate offer a testing service that can reduce dependence upon chemical wormers. A small quantity of fresh manure is checked for worms and eggs under a microscope. If the egg count is less than 200 eggs within 2 grams of the sample, the horse does not require a chemical wormer. Please use Enquiries ifyou would like to use this service.